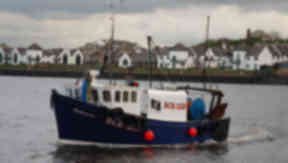 UPDATE: Daniel McNeil, 16, is named as the young fisherman who went missing when two vessels collided in the North Sea. A teenage fisherman lost at sea when his boat collided with a passenger ferry has been named by police. Daniel McNeil, from Tynemouth in North Shields, went missing after his boat and the Scottish Viking passenger ferry collided in the North Sea. The 16-year-old was on board the Homeland vessel with his brother when it made contact with the other boat five miles off the coast of St Abbs in Eyemouth, Berwickshire, on Thursday night. The 20-year-old elder brother - who is the fishing boat's skipper - was pulled from the water by another vessel. The official search for the teenager was called off, but family members and local fishermen are still combing the area to try and find him, police said. A Lothian and Borders Police spokesman said the family had asked the media to "leave them alone to allow them to come to terms with this tragedy". Four lifeboat crews and up to 20 fishing vessels were stood down from their search of the area on Friday night. The Homeland, registration number BH120, operates from North Shields in Tyneside. The passenger ferry is run by Norfolkline, part of DFDS Seaways, which operates services between Rosyth, Scotland, and Zeebrugge in Belgium. DFDS Seaways said the ferry was chartered by Norfolkline from Italian firm Visentini. Visentini said an investigation into the accident would be carried out. A spokesman said: "The owners are currently undertaking a detailed investigation into the circumstances of the collision and will provide all necessary assistance to authorities investigating this tragic incident. "Our thoughts are with the family." A DFDS Seaways spokesman said the company was "deeply concerned" about the accident. The Marine Accident Investigation Branch has also launched a probe.